The rich internal structure of ultracold molecules combined with their low translational energy enables precision measurements of fundamental constants, realizations of novel quantum phases, and applications for quantum computation. So far, large samples of ultracold molecules have been created by magnetoassociation of atom pairs. We demonstrate that stimulated Raman adiabatic passage (STIRAP) can be used to associate molecules from pairs of atoms on the sites of an optical lattice. This novel approach allows molecule formation in systems that are not suitable for magnetoassociation. The Sr2 molecules created here can be used as sensitive and model-independent probes for the time variation of the proton-to-electron mass ratio. Figure 1: Molecular potentials and states of Sr2 involved in our molecule creation scheme. The initial state |a>, an atom pair in the ground state of an optical lattice well, and the final molecular state |m>, are coupled by laser fields L1 and L2 to the excited state |e>. The insets show the last bound states of the molecular potentials and the wavefunctions of states |m> and |e>. Figure 2: Time evolution of STIRAP transfer from atom pairs to Sr2 molecules and back. 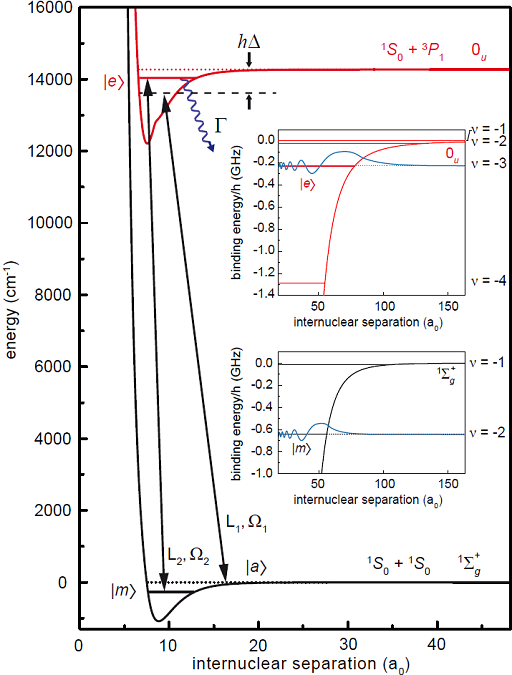 (a) Intensities of L1,L2, and cleaning laser C. (b) Atom number evolution. During the first 100�s, atom pairs are converted to molecules. 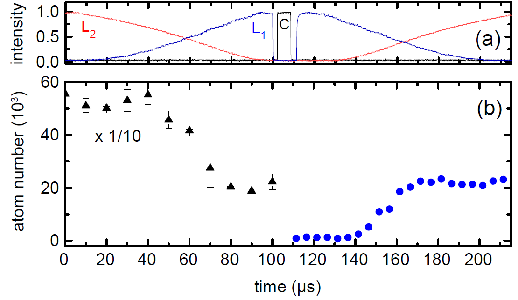 Remaining atoms are removed by a pulse of cleaning laser C. The reapparance of atoms during a time-inversed STIRAP pulse sequence proves that molecules have been created.